If you have a major hangover giving you that “curl up and die” feeling, then the Rapture IV Hangover Cure is for you. This is our flagship IV hangover cure and takes approximately 35-45 minutes to complete. The Rapture treatment is our flagship treatment, and contains everything you need to get back to your vacation from a debilitating hangover. Many people think that hangovers are only caused by dehydration – this is definitely not the case. For truly epic hangovers, one needs anti-oxidants, IV nausea medicine, IV headache medicine, and IV hydration to fully treat a Vegas-level hangover. 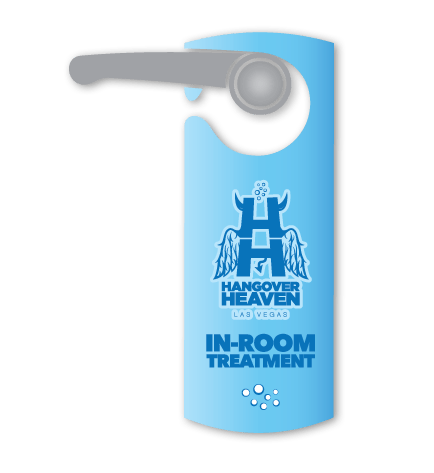 If you only purchase the Rapture IV Hangover Treatment, you will be treated at our convenient clinic. We offer free wi-fi and have relaxing recliners to make you comfortable during your treatment. Many people book their IV treatments ahead of time prior to coming to Las Vegas, as we get pretty busy at peak times around 10 AM in the morning on weekends. Please consider pre-booking on popular weekends such as Super Bowl, or the first two weekends of March Madness. Read our Trustpilot Reviews Here! Click here for our hours! Oh my gosh I was dying when I walked in! After a bottle of Don Julio last night I could not even talk. This place is magical the people are so nice and it works! Came here the last day of my bachelorette party…came in feeling horrible and left feeling so much better. The staff is very friendly and make you feel comfortable. Totally worth it! I live in Las Vegas, and was staying at a hotel for a work party. I woke up the following morning with that feeling of “I AM NEVER DRINKING AGAIN,” as I am vomiting, my head feeling like it’s being crushed by a semi-truck, my throat on fire, and shaking/dizzy. I arrived, saw the doors to my version of heaven, and went in. First of all, the staff is remarkable. You will deal with a few as they were busy checking on everyone but they each made me feel like I was the only person there (and trust me, I wasn’t). They made the experience amazing, and they get their own five stars! Then the magic happened. I sat back in a comfortable recliner, discussed some medical history with one of the staffers and then it began. They got the IV working, and started giving me medicine. Within minutes, my headache was gone, I wasn’t dizzy, and I could talk without wondering what else would be coming out. After about an hour, I was on my way. Feeling like a new person… Literally. On another note, I was feeling sick the day before the party and now I feel 100% again. Awesome!!! The people who work here are nice and helpful with figuring out which shot will work best for you. Plus they take care of their locals!!! I’ll be back for sure!